Where the Gym meets the runway – that is what PUMA strives for in their products for all the sporty and stylish women in the world. Now, PUMA is lifting that ambition to a whole new level! There is no one better to tell you what this is all about than PUMA’s training ambassador, style icon and international supermodel Adriana Lima herself! 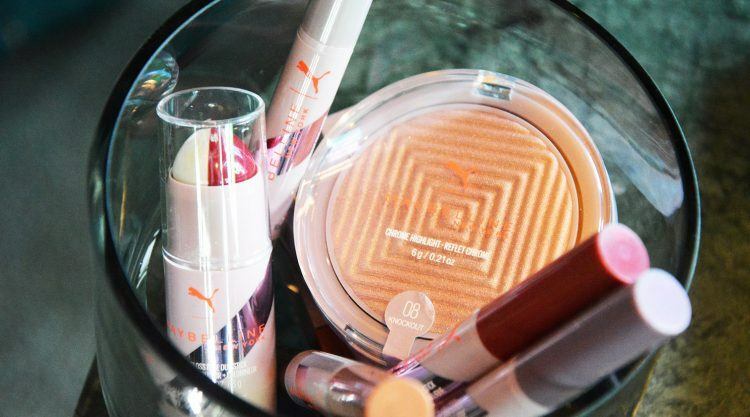 PUMA and Maybelline New York, the number one cosmetic brand in the world, teamed up for a high performance, street style-inspired makeup collection made for the gym as well as the runway (or the street, if you don’t happen to walk over catwalks on a regular basis). Of course, Adriana Lima had her favorite PUMA x Maybelline products with her in Berlin and let us all have a look at it. My favorite from the collection is the Duo Face Stick! It’s so multi-functional and can create so many different looks. I run around all day long jumping from one thing to another, so this has been a new lifesaver for quick touch ups to glam up or alter a look. The multi-functional collection features 12 pieces, all developed with the latest in long-wear technology. You get a smudge-proof mascara for all-day fierce lashes, a metallic highlighter and the Super Stay Matte Ink in limited-edition shades. In addition, Maybelline New York introduced two new duo sticks: a matte and metallic eye stick for day to night looks and a waterproof color and gloss face stick. Adriana Lima getting ready backstage at Maybelline New York’s Show in Berlin. Later that day in Berlin, the gym literally met the runway: At Maybelline New York’s Fashion Show at Berlin Fashion Week, Adriana Lima was killing it on the runway, dressed in PUMA from head to almost toe (high heels could not be missed) including the all new PUMA x Maybelline makeup of course. Rocking the runway with a group of dancers dressed in PUMA, she was undisputedly the highlight of the show. Catwalk suitability: check! Proving that the makeup also resists arduous workouts and sweat, Adriana Lima trained together with other PUMA trainers the next day. “When I go to the gym, I always have my mascara and lipstick on. Lipstick in the gym? Yes, why not?! You want to look cute over there, right?” Adriana explained. Yes, indeed! Even better that there is a sweat-proof makeup now. All the stylish women out there, be quick to get a hand on the collection, because it will only be in stores for a few weeks! Visit Maybelline / PUMA to find out when the collection launches in your country! How do makeup and fitness go together in your daily life? I’m a boxer and love a good sweat. That natural sheen of sweat and flush of the cheeks is just as beautiful in my opinion as a full face of makeup, so I try to replicate that in my day-to-day look. A little bit of mascara and some highlighter and I’m out the door! Do you have a go-to product from the collection to take you from gym to work or social event? The Color and Gloss Face Duo Stick is so perfect for a quick touch up when I’m bouncing from events to meetings to the gym. I swipe the color side under my cheekbones for a bit of color and the glossy side on my lids and lips for a dewy look. What is your best no-fail makeup application tip? Highlighter on your cheekbones and brow bones. I know it’s a tip you hear often, but it really works well to amplify the high points of your face and it’s so easy. Sometimes I’ll even just take my finger and dust the Chrome Highlight on my brow bones and tip of my nose and cupid’s bow for a subtle glow. Adrina Lima (in the middle) with the other PUMA trainers in Berlin. The 37-year-old has been in the modeling and sports business for more than 20 years. 80% of her training is boxing. "This collection is perfect for women who are always on-the-go. Everything is multi-functional, and all of the products are packaged in these great compacts. I try to travel light and keep things very practical, so this collection really reflects that", she says about the PUMA x Maybelline Collection.